The island of Cozumel is a major cruise port that welcomes more than a million cruise passengers each year. When they land, many of those cruise passengers head to beautiful Chankanaab Park which houses the Cozumal Mexico Animal interactions. Watch this Video to see what you will be getting in this amazing Mexican Park. If you are one of the many Cruise Ship passengers that come to this beautiful Mexican Island, you are in for a real treat if you book early and come swim with the Dolphins and explore Chankanaab National Park. This one/two combo of the dolphin program and this amazing national park is a can not miss shore excursion! The thing that makes Dolphin Discovery so popular is that they offer one of the most interactive dolphin swimming programs in all of the Caribbean. Visitors are given snorkeling masks to wear which allows them to submerge themselves into the underwater world of the dolphin and watch them in their natural habitat. The dolphins love interacting with people and will give you a hug and a kiss and wave a big hello with their fin. 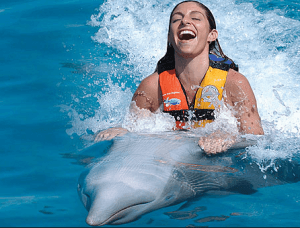 You’ll also be able to try the famous dolphin belly ride, possibly one of the most memorable experiences of your life. For those who want to know what it feels like to fly, try the famous foot push, where two dolphins push your feet from underneath and raise you to the surface of the water! You’ll soon discover that Dolphin Discovery offers more than “just” swimming with dolphins, you’ll also get a chance to enjoy the funny and playful sea lions. The Sea Lion Discovery Program gets you up-close-and-personal with these adorable and extraordinarily inquisitive creatures all while you take in the astounding beauty of the Mexican Caribbean around you. 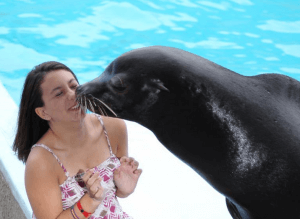 Learn about the sea lions diet and feed them at the same time, pet them and get a big, wet kiss from them too. If you’ve always wondered if mermaids were real, the answer is yes… well, sort of. Manatees were once thought to be mermaids, despite their rather hulking bodies and not very pretty faces. These gentle giants of the sea can grow to be 13 feet long and weigh as much as 1300 pounds and you can get up close in Dolphin Discovery’s one-of-a-kind Manatee encounter. Kiss them, hug them and feed them while you swim and play in their natural habitat. As you can see there are plenty of exciting activities to enjoy at Dolphin Discovery for visitors of all ages. You can also spend part of the day enjoying the welcoming atmosphere, friendly locals and stunning natural landscapes of Cozumel, one of the most beautiful Caribbean Islands. 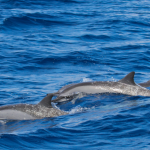 Your Dolphin facility is situated in the heart of Chankanaab National Park. Your dolphin fee includes the park at no extra cost. This park is one of the masterpieces of nature, since been declared National Park in 1980, it has been considered a special area for the protection and shelter of fauna and flora of the region. Enjoy the beautiful Chankanaab beach adventure park and spend the day either snorkeling or diving, while admiring tropical fish, colorful reefs and underwater sculptures. 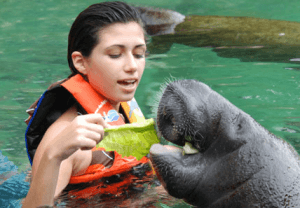 You can also enjoy a tortilla made by hand in our Mayan house, visit the crocodile farm, see the show of the sea lions, or perhaps relax with a massage in front of the lagoon that gives its name to the park. These are just some of the many activities you can enjoy Chankanaab. In Chankanaab beach adventure park they have Mexican restaurants and dive shops where you can rent equipment for snorkeling and diving. Also have hammocks area, playground, a museum and a space where you can enjoy the beach’s soft sand and crystalline waters. The admission fee to Chankanaab park is 21 USD for adults and 14 USD for children. But all our programs with dolphins, manatee and sea lions, include free entrance, therefore you won’t be needing a Chankanaab Park Coupon. This is equivalent to a discount of 21 USD, included in the price. You save 21 USD per person! Where is Dolphin Facility in Cozumel island? 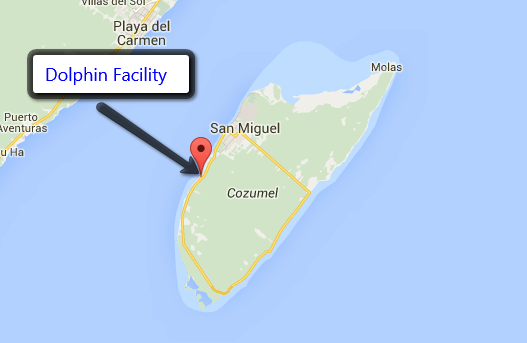 How far is Dolphin Facility Cozumel from the Cruise Ship dock? Is there transportation from the federal dock Cozumel to the Dolphin Facility? We recommend you to bring sneakers, bathing suit, biodegradable sunscreen, sunglasses, camera, towels, cap or hat and extra money.